I absolutely love this picture/pictures! They matched my decor perfectly and were prettier than I even thought they would be. 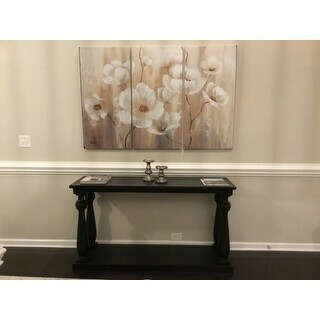 This is a great art choice for a large area! 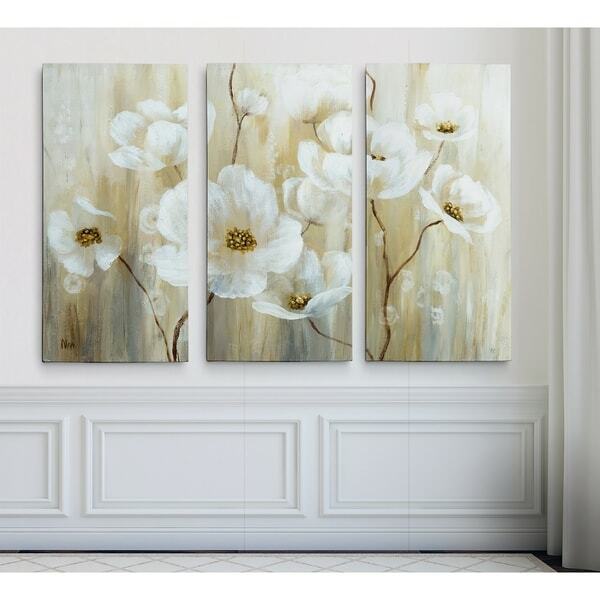 Shimmering Blossoms -Gallery Wrapped Multi Piece Canvas A premium hand wrapped Giclee canvas. 100-percent Created to last. Individually hand wrapped to very high standards. Printed and inspected one at a time utilizing the latest archival UltraChrome Giclee inks Available in 3 sizes for you to choose from 24"X36" TOTAL SIZE - Consisting of 3 Total Panels Each measuring 12"x24" x1.5" deep 32"X48" TOTAL SIZE - Consisting of 3 Total Panels Each measuring 16"x32" x1.5" deep 40"X60" TOTAL SIZE - Consisting of 3 Total Panels Each measuring 20"x40" x1.5" deep Each piece includes hanging accessories and is ready to hang. You need only to apply an anchor to the wall of your choice. We ordered this in the three panel because we have a large foyer with high ceilings and needed something rather large. Our walls are agreeable gray and we have some beige/creme creme in the adjacent dining room. This picture ties the two rooms together. These are just okay. They are large enough to place behind the futon in the guest room as planned. They were also very easy to hang. However, the pictures don't seem to be as bright and bold as they appear online. I was expecting them to be whiter and brighter. I plan to keep them though as they are passable and will suffice. I keep moving these shimmering blossoms around because they look good and go so well everywhere. They will finally remain in my guest room. My daughter made the request that they be in the room she always stays in when she comes to visit. It's exactly what I wanted, nice quality and looks just like it did online. Looks beautiful! we love how it looks in the room! We originally purchased one set but went back and purchased another because we loved it so much! I like the three separate dimensions. I hope I am happy with this painting for my dining room!